So we have our lovely cat family, right? Well, as we all know, they share the crescent moon mark of the Royal Moon family (specifically the women, since Endymion is not from the moon). We often have allusions to the cat's crescent (Luna, usually) being a bald spot. What if their marks are actually brands? We know that the cats (Luna and Artemis) are from Mau (the wiki lists them as aliens from Mau, and just residents of the moon). In their human forms, they also bear the crescent marks. However, Sailor Tin Nyanko, also a resident from Mau, does not have a defining mark. So what if it's just a mark of the moon people? Do the other citizens bear this mark? 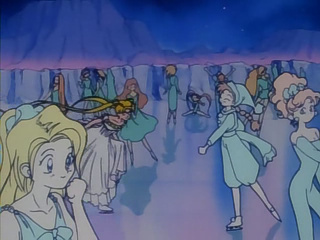 In the anime, we never actually see any other citizens of Silver Millennium, save for one episode, the ice skating episode. We see all these moon people skating in the Sea of Serenity, but none of them have crescent marks. It would seem that the crescent moon mark is the mark of Silver Millennium's royalty. We know that the cats are not from the moon, nor are they royalty, so why do they share the mark? Perhaps as official members/guardians of the moon family, they were given the mark as a show of rank. But then, why didn't King Endymion receive a mark? Bald-spot makes me think of a brand, but that seems a tad barbaric for such peaceful people, so maybe it was a magically-inferred mark? I dunno man. I was thinking at all of this at two in the morning. It's hard to say as to why some do and some didn't. It is the mark of royalty, so perhaps they did receive the mark in regards to working as advisors. I'd imagine that Endymion wouldn't be able to get the mark because he's already royalty of another planet and is basically sailor earth. It could have been a conflict of power-literally. Ooh, that's a good point. But technically, in the future, King Endymion becomes royalty of the Earth along with Serenity, he wasn't already the prince. Who's to say? But he didn't get a royal mark, did he? I still think it's because of his royal earth bloodline, but I think that's drifting into another possible theory. This is not something supported by textual evidence, but this is my take on it. 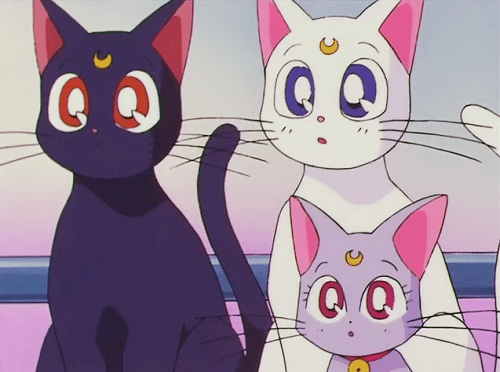 I think that Luna and Artemis received the mark (magically) as a sign of their allegiance to the Moon Kingdom. They are from Mau but they are working for Queen Serenity and her Silver Millennium, so I think the crescent moon is symbolic of their loyalty. I think that Diana inherits it from her parents because, by the time she is born, it is so much a part of them (at that point, they've pledged their lives to the White Moon and its descendants, basically) that it become hereditary. I think she was born with it. 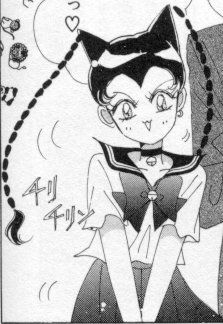 ^Either that, or she received it shortly before being given to chibiusa, since she was going to be, and is, chibiusa's guardian. I have no idea how a mark would be passed down at birth, unless there was magic of the moon kingdom in their veins from being advisors for so long. How old were they when diana was born, anyways? Well a couple things. First of all the crescent mark appears on the forehead itself. Tin Nyanko always has that part of her forehead covered with her hat/headdress so you can not say for certain whether or not she has a mark there. Second of all was it not a thing that as a cat Luna was unable to speak when her crescent mark was covered up like by the bandage? So with that said I have theory. I actually do think that mark was a gift imparted by Serenity with the Silver Crystal not so much as a brand but to grant the power to understand/speak other languages. Thus it's probably how Luna/Artemis were able to understand the language(s) used on the moon and on Silver Millennium period Earth (in Another Story which I know is not canon but it still fits the concept), as well as to understand/speak modern Japanese (and possibly English for her S movie journey to America).